The Parker RB-1 began life in 1981 as a cheap to produce but stylish looking carrier for the new Parker Rollerball System. 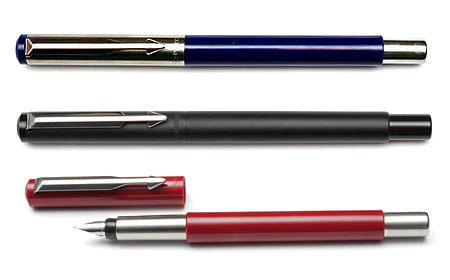 By the beginning of 1984 a new fountain pen version, the FP-1 was added to the line up and within a few months the name was changed to the Parker Vector. By the end of 1984 the design was slightly changed, the easiest difference being that the newer version had a slightly longer cap and gripping section. The very earliest pens had a slightly different clip arrow which included "Parker" engraved on it whilst later ones had plain clips. The clip was changed again (possibly around 1994) with the new style having a much more tapered arrow compared to the more squared off earlier versions. The Vector was produced in the UK an the Parker Newhaven factory until it closed in 2010 after which production was moved to India and China where the Vector continues to be produced. 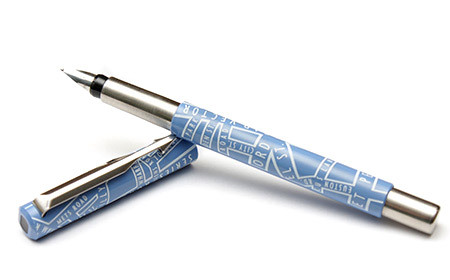 The Parker Vector may not enjoy the same build quality of some of the older Parkers but the huge variety of colours and designs ensures that they have a cult following amongst some collectors.